I’ve been looking for this rock art panel for over a year and finally managed to find it over the Thanksgiving weekend. It took me three separate trips to find it, so I guess the third time’s the charm! 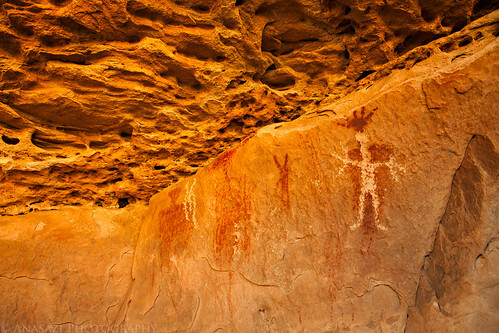 I find it interesting that the petroglyph on the right is placed right over a larger pictograph which makes it really stand out. The texture on the ceiling of this overhang is just amazing, and I managed to visit this site at the right time of the day since there was some nice reflected light bouncing around.